Dollycats is located in the Dorset countryside in a village called Corfe Mullen, between Wimborne and Poole and on the borders of Hampshire, not too far from the New Forest. 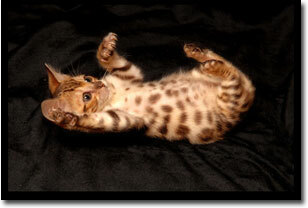 We breed Bengal cats as well and have kittens available at most times. We will also be breeding the very exclusive Savannah Cat in 2008. All of our cats are fully vaccinated, wormed and micro-chipped. They are registered with either the GCCF or TICA and come with a pedigree certificate and several goody bags. They are bred from championship British and American lines and are handled from the day they are born to ensure you have a loving, sociable and confident kitten.